Montana Sapphire - precious gems found in Montana. One of the 3 semi-precious gems, Montana sapphires come in a rainbow of colors. Montana sapphire deposits produce every hue of sapphire known but in general, they do tend to be light blues and greens, resembling sea-glass or old broken coke bottles. Montana is known as the Treasure State for a good reason but the sapphires are a focal point of that. The sapphires found in the El Dorado Bar of the Missouri River range from 1 to 12 carats, with the largest found at Montana Gems of Philpsburg to date being 34.7carats! 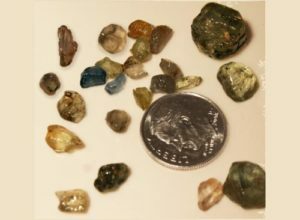 Sapphires from this deposit tend to run larger than Rock Creek gems but are tough to spot due to their rough shape and muted colors amongst the river gravels. El Dorado sapphires come in a wide range of colors, with several color-shift stones being produced. You may find an occasional ruby, garnet, and/or hematite specimen. Often the hematite has replaced various seeds, nuts, even clam shells and give you a fossilized impression that’s quite interesting and fun to add to your collection. This material may also contain small flakes of gold, fossils or petrified wood. Rock Creek sapphires come from the Mountains of Philipsburg, near Gem Mountain Peak. They provides another flavor or sapphire mining. This deposit is rich in clay, making it a little tougher to wash clean but the sapphires have a little more polished or rounded look, making them easier to spot. These little gems respond well to heat-treating and often produce the beautiful blue hues that Montana sapphires are known for. Traditional September Birthstone and gem designated for the 5th, 23rd and 45th wedding anniversary. Imaging having a birthstone that can by any color you choose! Said to bring joy, peace, beauty, intuition, prosperity and fulfillment of dreams. Of all precious gems, the sapphire is the hardest stone next to diamonds, with a hardness factor of 9.0 on the Mohs Scale. Making Sapphire the second hardest natural mineral and a gem that can give you years of enjoyment. Sapphires are a variety of the mineral species corundum and occur in all colors of the rainbow with the exception of red, which is the ruby. Ancient civilization believed that the power of wisdom is contained within sapphire. They believed that when the wearer of a sapphire faces challenging obstacles, the stone’s power enables them to find the correct solution. Sapphire improves mental clarity and clear thinking. It helps clear mental garbage. Sapphires are also considered an anti-depressant and an aid to psychokinesis, telepathy, clairvoyance and astral projection. They hold healing properties for rheumatism, colic and mental illness. In Medieval times, sapphire was thought to be an excellent antidote for poison. Because of its blue color, sapphire is associated with the throat and brow chakras-where energy imbalances are said to cause sore throats, headaches, and nightmares. 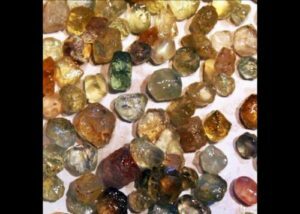 Gem therapists use sapphire to help rid unwanted thoughts, bring joy, peace, and wealth. Also thought to help heal blood problems. Sapphire powers include spiritual enlightenment and inner peace. It’s said to enhance creativity and to focus purity of thought. Known as the stone of new love and commitment and claimed to be useful in encouraging faithfulness and loyalty. It dispels evil thoughts and brings peace and amiability to its wearer. The blue color is often associated with the heavens and believed to bring divine favor and repel envy.